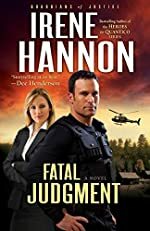 MystereBooks is pleased to feature Fatal Judgment by Irene Hannon as today's free mystery ebook. We don't know how long it will be offered at this special price (typically only until a certain number of downloads have been completed), so we urge you to download it while it is still available for free. About Fatal Judgment (from the publisher): U.S. Marshal Jake Taylor has seen plenty of action during his years in law enforcement. But he'd rather go back to Iraq than face his next assignment: protection detail for federal judge Liz Michaels. His feelings toward Liz haven't warmed in the five years since she lost her husband — and Jake's best friend — to possible suicide. How can Jake be expected to care for the coldhearted workaholic who drove his friend to despair? As the danger mounts and Jake gets to know Liz better, his feelings slowly start to change. When it becomes clear that an unknown enemy may want her dead, the stakes are raised. Because now both her life — and his heart — are in mortal danger. Read our review of Fatal Judgment by Irene Hannon. The Sixes by Kate White. Non-series. Harper Hardcover, August 2011. The premise for this book is fine — a secret society on the campus of a small rural college that may or may not be involved in murder — but it's never fully developed or realized and seems more appropriate for the outline of a movie-of-the-week rather than the plot for a novel of suspense. 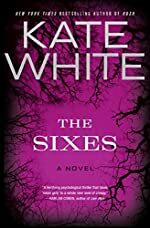 Read the full text of our review at Mysterious Reviews: The Sixes by Kate White. 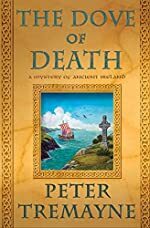 About The Dove of Death (from the publisher): In A.D. 670, an Irish merchant ship is attacked by a pirate vessel off the southern coast of the Breton peninsula. Merchad, the ship’s captain, and Bressal, a prince from the Irish kingdom of Muman, are killed in cold blood after they have surrendered. Among the other passengers who manage to escape the slaughter are Fidelma of Cashel and her faithful companion, Brother Eadulf. Once safely ashore, Fidelma — sister to the King of Muman and an advocate of the Brehon law courts — is determined to bring the killers to justice, not only because her training demands it but also because one of the victims was her cousin. The only clue to the killer’s identity is the symbol of the dove on the attacking ship’s sails, a clue that leads her on a dangerous quest to confront the man known as The Dove of Death. About the author: Peter Tremayne is the fiction pseudonym of Peter Berresford Ellis, a renowned Celtic scholar who has written over 30 books on the Ancient Celts and the Irish. As Tremayne, he is best known for his stories and novels featuring 7th century Irish religieuse Fidelma of Cashel. He lives in London. The Keeper of Lost Causes by Jussi Adler-Olsen. A Carl Mørck, Department Q Mystery. Dutton Hardcover, August 2011. The police procedural aspect of the book is excellent, with the pieces of a missing person's puzzle all contained within a five-year-old cold case file. It's a real pleasure following Mørck along as he puts them together in an effort to locate "the woman in the cage" (the original Danish title of this book). 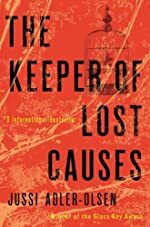 Read the full text of our review at Mysterious Reviews: The Keeper of Lost Causes by Jussi Adler-Olsen. The Queen by Steven James. A Patrick Bowers Mystery. Revell Trade Paperback, September 2011. This thrilling adventure-style mystery has lots of twists and turns and plenty of action. But what makes it truly special are the characters of Patrick Bowers and his step-daughter Tessa, who bring a grounded personal element to the story that contrasts well with the unpredictability of the storyline. 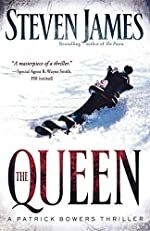 Read the full text of our review at Mysterious Reviews: The Queen by Steven James. 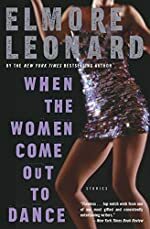 A list of the top 15 mystery hardcover bestsellers for the week ending September 23rd, 2011 has been posted by the Hidden Staircase Mystery Books. Retaing the top spot — and we have to say, we're somewhat surprised at the staying power of this book — is The Girl Who Kicked the Hornet's Nest, the third and final thriller in the Millennium Trilogy by Stieg Larsson. Two new titles debut on the list. 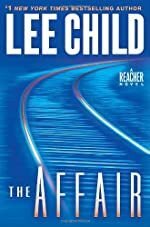 New at number 11 is The Affair, the latest Jack Reacher thriller by Lee Child. Reacher is ordered undercover — to find out everything he can, to control the local police, and then to vanish. Reacher is a good soldier. But when he gets to Carter Crossing, he finds layers no one saw coming, and the investigation spins out of control. Local sheriff Elizabeth Deveraux has a thirst for justice — and an appetite for secrets. Uncertain they can trust one another, Reacher and Deveraux reluctantly join forces. Reacher works to uncover the truth, while others try to bury it forever. The conspiracy threatens to shatter his faith in his mission, and turn him into a man to be feared. 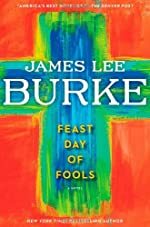 And just making the list at number 15 is the third Hackberry Holland mystery, Feast Day of Fools by James Lee Burke. Sheriff Hackberry Holland patrols a small Southwest Texas border town with a deep and abiding respect for the citizens in his care. Still mourning the loss of his cherished wife and locked in a perilous almost-romance with his deputy, Pam Tibbs, a woman many decades his junior, Hackberry feeds off the deeds of evil men to keep his own demons at bay. When alcoholic ex-boxer Danny Boy Lorca witnesses a man tortured to death in the desert and reports it, Hack’s investigation leads to the home of Anton Ling, a regal, mysterious Chinese woman whom the locals refer to as La Magdalena and who is known for sheltering illegals. Ling denies having seen the victim or the perpetrators, but there is something in her steely demeanor and aristocratic beauty that compels Hackberry to return to her home again and again as the investigation unfolds. Could it be that the sheriff is so taken in by this creature who reminds him of his deceased wife that he would ignore the possibility that she is just as dangerous as the men she harbors? The danger in the desert increases tenfold with the return of serial murderer Preacher Jack Collins. Presumed dead, Preacher Jack has reemerged with a calm, single-minded zeal for killing that is more terrifying than the muzzle flash of his signature machine gun. But this time he and Sheriff Holland have a common enemy. 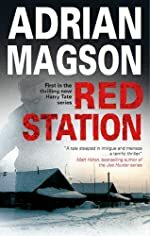 The 2010 spy thriller Red Station by Adrian Magson, which introduces MI5 officer Harry Tate, has been optioned for film. A search for a screenwriter is currently underway by the studio. The second book in the series, Tracers, was published earlier this year. The producers are no doubt considering a franchise here. This collection is also the source material for the FX series Justified — the short story "Fire in the Hole" features US Marshal Raylan Givens played by Timothy Olyphant. One of the stories included here, "Karen Makes Out", features US Marshal Karen Sisco, which is the principal character in the 1998 film Out of Sight and in the 2003 television crime drama Karen Sisco. It seems unlikely that a new series would be developed around this character, but remakes are currently all the rage at the networks, so it's always possible. The epic adventure, with an element of suspense, features two young men, master and slave, who embark on a quest to restore one family's honor. It is a solid combination of story, look, and action, the only significant downside being some rather wooden acting on the part of the principals. 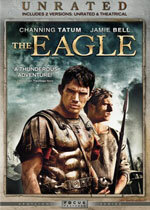 Read the full text of our review at Mr. E. Reviews The Eagle. 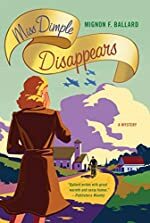 About Miss Dimple Disappears (from the publisher): It is 1942, and most of the men in the town of Elderberry, Georgia, have gone to war. One frosty morning just before Thanksgiving, young schoolmistress Charlie Carr and her fellow teachers are startled to find that the school custodian, Wilson “Christmas” Malone, has neglected to stoke the furnace or empty the wastebaskets — and then is found dead in a broom closet, the apparent victim of a heart attack. But when Miss Dimple Kilpatrick, who is as dependable as gravity and has taught Elderberry first graders — including Charlie — for nearly forty years, disappears the following day, town residents are shaken down to their worn, rationed shoes. Knowing that Miss Dimple would never willingly abandon her students, Charlie and her friend Annie begin sleuthing — and uncover danger surprisingly close to home. About the author: A native of Calhoun, Georgia, Mignon Ballard received her degree in journalism from the University of Georgia. She is the author of the Augusta Goodnight mysteries as well as other novels for adults and children. She lives with her husband, Gene, in Fort Mill, South Carolina, where she enjoys spending time with friends and family, as well as walking, baking, and bridge, and is active in her church and community theater. Visit her website at MignonBallard.com. The Reservoir by John Milliken Thompson. Non-series. The Other Press Trade Paperback, June 2011. This historical fact-inspired novel is written in such a style that it includes the language of the time and place, giving it an air of authenticity that provides a strong foundation for its fictionalized storyline. 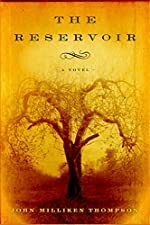 Read the full text of our review at Mysterious Reviews: The Reservoir by John Milliken Thompson. Omnimystery News is pleased to welcome writer Liz Strange. 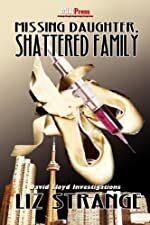 A published author of paranormal, horror and fantasy fiction, her first mystery is Missing Daughter, Shattered Family (MLR Press, September 2011 trade paperback and ebook editions), which introduces Toronto PI David Lloyd. Today Liz writes about the traditional detective story … with a twist. I’m often asked where I get my ideas from. Sometimes the answer is very clear cut — a news segment, song lyrics, sometimes just an image. The story behind Missing Daughter, Shattered Family and the book’s central character, David Lloyd, was more muddied. The final story came from a culmination of several incidents (both real and imagined), my love for dance, a desire for story set close to home (SE Ontario) and my support of GLBT rights. So where did this jumble of ideas and experiences take me? First, to the development of my detective, a character I wanted to stand out from his peers. David Lloyd doesn’t possess super powers, he isn’t the offspring of royalty or famous parents and he doesn’t drive a cool car. He is a regular guy — a son, grandson, ex-husband and former police man. He’s also gay. Now that isn’t the controversy-stirring premise it might have been, say, twenty years ago, but it is outside of the traditional elements of a standard detective novel. David Lloyd was once a police officer for the Metro Toronto Police department. He came from a solid middle-class family, had a lovely wife and reputation as a hard-worker and dedicated professional. Yet despite all of his success, he wasn’t happy. He was living a lie, and the stress of keeping his secret was killing him. Finally he couldn’t take it any longer. The decision to come clean, or come out if you will, changed his life forever. At the time he had no idea where the truth would take him, or the consequences to his physical well-being and his career. A shocking homophobic attack would leave him partially deaf and with a bum knee. Even worse he would never be able to return to active duty as a police officer. Refusing to give up, David uses this tragedy as a stepping stone for the next phase of his life by opening his own detective agency. One thing still haunts him though. The men responsible for his attack were never brought to justice. David is sure he knows who was responsible, and he won’t stop until he can prove it. This part of the story was partially inspired by a real-life situation, a viscious attack on a young police officer in my hometown that was never solved. My twist on the event came from the inspiration for the attack. Fast forward five years in David’s life and he’s brought into the case of a troubled young woman who’s gone missing, a former dancer. Here I got to live out my childhood fantasy of being a professional dancer, and was able to incorporate this unique niche of society into the fabric of the story. All in all I think the elements came together in a pleasing, cohesive way, birthing a strong, compelling character that I hope to continue writing about for many years. Liz Strange — yes, it is her real name! — loves to hear from her readers and will answer any questions sent her way. You can learn more about Liz and her books on her website, LizStrange.com. When a brutal homophobic attack ended David Lloyd's career as a police officer, his life was changed forever. Five years later David is running his own private detective agency, where a missing person's case comes to his attention. Digging into the circumstances of her disappearance forces David to realize he has not dealt with what happened to him, and that he can no loner deal with his long-time partner's fear of being honest about their relationship. Solving the case might not only bring peace to a shattered family, but could finally put David's own demons to rest. 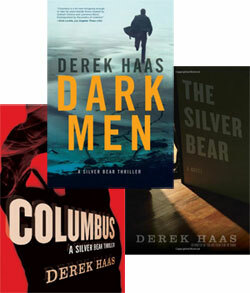 This December, Pegasus Books is publishing Dark Men, the third title in the Silver Bear series of thrillers by Derek Haas. But just a month later, in mid-January, Mulholland Books has a listing for an ebook omnibus of all three books: The Silver Bear, Columbus, and Dark Men. About the series: He calls himself Columbus. His real name never meant much to him anyway. He never knew his father, an earnest young congressman, a rising star in the Democratic Party named Abe Mann, or his mother, a prostitute whose involvement with Mann would prove dangerous. All Columbus cares about is his next target. A hit man whose quickly made a name for himself as one of the best despite his years, you can be sure he'll fulfill whatever contract's been given him. Even if those who put out the hit have other plans in mind. 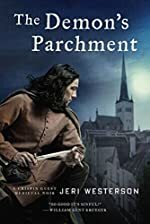 About The Demon's Parchment (from the publisher): In fourteenth century London, Crispin Guest is a disgraced knight convicted of treason and stripped of his land, title and his honor. He has become known as the “Tracker” — a man who can find anything, can solve any puzzle and, with the help of his apprentice, Jack Tucker, an orphaned street urchin with a thief ’s touch — will do so for a price. But this time, even Crispin is wary of taking on his most recent client. Jacob of Provencal is a Jewish physician at the King’s court, even though all Jews were expelled from England nearly a century before. Jacob wants Crispin to find stolen parchments that might be behind the recent, ongoing, gruesome murders of young boys, parchments that someone might have used to bring forth a demon which now stalks the streets and alleys of London. About the author: A journalist and noted blogger on things mysterious and medieval (Getting-Medieval.com), Jeri Westerson lives with her family in Menifee, California. Visit her website at JeriWesterson.com, and learn more about her series character at CrispinGuest.com. Crime novels by Jeri Westerson reviewed by Mysterious Reviews: Veil of Lies (2009).